Experience the ZERØGRAND Oxford with Stitchlite™ Wool: Lets feet breathe. Keeps feet warm. Cools feet down. Stitchlite™ Wool is a winterized premium wool blend that breathes easy, minimizes odor, and naturally insulates to keep your feet warm and cozy. All while repelling heat and moisture so stay comfortable. I bought these amazing sneakers for a trip to Europe! I absolutely love them. Never felt tired or had backpain. Stylish and classy. Loved these as soon as I tried them on. You can dress up and dress down - I love wearing them to work and also to a causal weekend in the city. These keep my feet cool when it’s hot out and warm when it is cold out. I love it. It’s so comfy and very lightweight! Love these so much I bought them in another color! They are super comfortable, go with anything, and you can wear them all day. I love wearing these as slightly dressy walking-around shoes. They're comfortable and breathable. I normally wear a 9-9.5 size; these fit me perfectly without a sock in a 9.5. They’re the most comfy shoes in the whole world I love emm!! Wore this shoe around London for a week in November. They were warm and comfortable. I was worried about getting them wet, but the sales person told me they were part Alpaca and were treated for water. Cole Haan you should advertise that....it's the only reason I tried them on. And I'm so glad I did!! 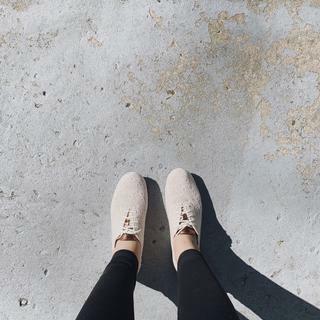 So comfy and perfect to go from work to errands! I love these. Warm, light as air, and I get lots of looks. Its super comfy. I love it! I chose these shoe because I already have a pair I love. With a casual dress they are perfect and comfortable. I already own a similar pair of C.H. and I can't honestly think of any pair of shoes better for an everyday use! I love the color combination of cream and rose gold details. Plus the wool is so comfy! These shoes are the MOST comfortable ones! they are very light and flexible. I LOVE THEM! THE SHOE IS SO LIGHT. IT IS A GOOD SHOE FOR SUMMER AND SPRING TIME. My daughter has a pair and I loved them. Lightest, most comfortable shoe I've ever purchased! Will take to Europe. It looks light and comfortable. I don't care for clunky tennis shoes. I also like the heel tab in the back. Little bit of shine. Style, material, heel comfort, reviews, on sale. The look and hopefully the feel. THIS IS MY 6TH PAIR! IF YOU WALK AND ALWAYS ON YOUR FEET FOR WORK! THIS IS THE SHOES YOU MUST HAVE! How do you clean the ZERØGRAND Oxford with Stitchlite™ Wool? BEST ANSWER: Stitchlite Wool uppers should be spot cleaned with a soft, damp cloth and a small amount of mild detergent. Dab the soiled area and repeat if needed. Allow to dry completely away from heat. I have the black Stitchlite that is not wool and I had to go half a size down. Do these also fit the same way or are they more true to size? BEST ANSWER: If you have the original stitchlite zerogrands they should fit the same way. However, if you have the 2.Zerogrands those tend to run a half size bigger and will not fit the same as the wool. I am a 6 1/2, bought 6 1/2 and it fit perfect, even with socks on. I noted they stretched a tiny bit, but still very comfortable. The wool are not quite as stretchy, but I would still buy the same size as you did in the other shoe. The wool is a bit snug on me but I have a wider foot. My size is 6 should I get size 6 or 5.5 ? An these be-worn without socks or best to wear with light sock?. Totally personal preference - all depends upon your sock-less comfort level! Hi! Can you send size 5.5 in centimeters? BEST ANSWER: Our footwear is manufactured in standard American Men's and Women's sizing. We do not have individual dimensions in centimeters. When you click on the Size Guide link to the right of the Width selection drop down box, you will see a size chart for US, EU and UK sizing. Please call our Online Customer Service team at 800-695-8945 for assistance with placing an order.